Sep 30, 2013 Time for Updates! I am 36 years old and live in Germany. I am interested in many things reaching from Design to Astrophysics. A Jack-of-all-Trades but master of none… always looking for new ways to express myself and to give my thoughts a form. I like aesthetical clean Design that keeps functionality in mind as well as colorful fantastic illustrations or monochrome abstract photography. All my stock and resource Stuff got a new and fresh Coverdesign (with a few exceptions). Also i have sorted out some older resources that do not meet my own quality standards. Plaintextures has raised the available content greatly with tons of new high resolution, tiled textures (seamless textures) and a growing libary of brushes (abr and jpeg). 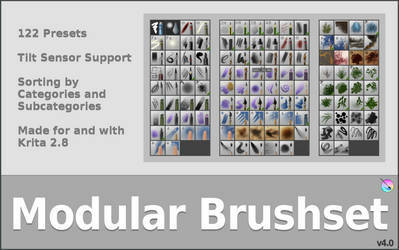 Useful for a wide range of software and tasks (stamp, texturize, painting/drawing brushtips, alphas for sculptris/zbrush and more...). It's worth to take a look at this site - the account is free. No spam or anything negative to say about from my side. Krita has made big steps in development, being faster and more stable on all platforms, where it is available (including Windows builds). Krita is a great opportunity for young artist, who dive into the business as well it is a true alternative or addition for any professional. Do not ask if Krita beats commercial software, cause Krita goes own ways with Developers that truly hear and response to the needs and wishes of the Artists using it. As a young artist you have the unique chance to grow together with Krita and its community - so don't miss it! The last recommendation goes to the Gimp users on Deviant Art. Since i have started to use G+ more intensively in the last months, there is one community, that has become a really nice place for me to get in touch with interesting people that share the same passions - Gimp Users on G+. Que tengas un Feliz Cumpleaños junto a tus seres queridos y que cumplas muchos años más y que Dios en este año Te colme de Bendiciones y felicidad mi amigo. Feliz Cumpleaños Vasco... Dios te Bendiga Grande y Abundantemente...!!! Thank you very much for the kind wishes, Jean! Thank you very much, catelee!